Art can seem very separate from our daily lives today, and, as our society careens its way through change and conflict, it may seem increasingly irrelevant. 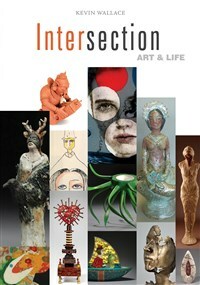 Art advocate Kevin Wallace, director of the Beatrice Wood Center for the Arts, provides reminders of how and why we thrive when we connect art and life, including first-person insights from 150 contemporary artists like Binh Pho, Kay Sekimachi, Avital Sheffer, Lino Tagliapietra, Jan Hopkins, Beatrice Wood, and dozens more. Throughout history, art was naturally intertwined with people's daily lives: a bowl for water, a carving to record a war, objects to capture religion and identity. This handbook juxtaposes our past with "big ideas" relating to contemporary art, helping to demystify them so that we can repair the connection, and turn our lives into art. Kevin Wallace is an independent curator and writer, focusing on contemporary art in craft media. He is a member of the Board of Directors of Collectors of Wood Art and on the Advisory Board of the Handweavers Guild of America. He is a contributing editor for "American Woodturner" and "Shuttle, Spindle & Dyepot" and a regular contributor to "Craft Arts International" (Australia) and "Woodturning" magazine (England), writing about contemporary art in craft media (wood, ceramic, and fiber) and wood artists. Wallace is the author of seven previous books.